In you Oro application, you can enable or disable guest website access, in addition to managing its different aspects, such as guest shopping lists, guest checkout, guest RFQ and guest quick order form. In order to prevent non-registered customers from accessing OroCommerce storefront, the administrator can disable website access by non-authenticated visitors. This can be done globally, per website, or per organization. New users can register, if self-registration is enabled in Commerce > Customer > Customer Users > Registration Allowed. Guest users can register if self-registration is allowed, even if the website access is closed. Guest users cannot access any website pages, except for the login/forgot/reset password page. Guest users are redirected to the login page when they try to access the homepage. 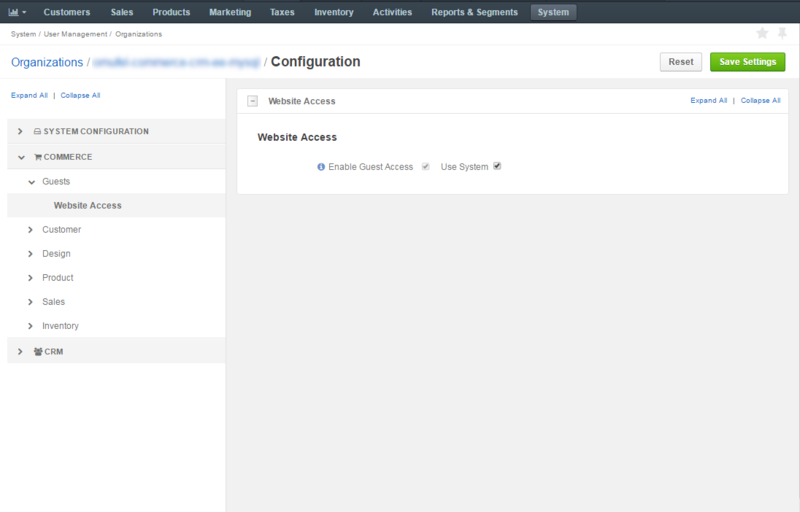 Navigate to System > Configuration > Commerce > Guests > Website Access. Select the Enable Guest Access checkbox. To disable guest access globally, clear the Enable Guest Access checkbox. Navigate to System > User Management > Organizations. For the necessary organization, hover over the More Options menu to the right of the necessary organization, and click to start editing the configuration. 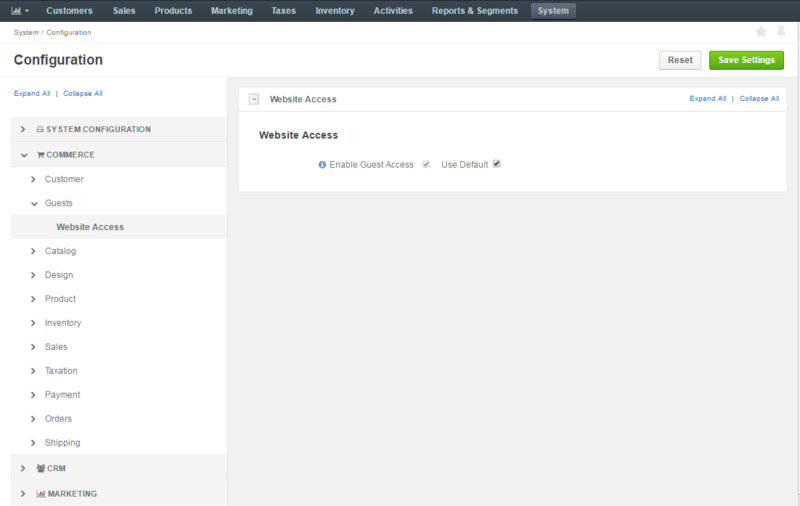 Select Commerce > Guests > Website Access in the menu on the left. Navigate to System > Websites. For the necessary website, hover over the More Options menu to the right of the necessary website, and click to start editing the configuration. Guest checkout allows unregistered customers proceed through the steps of the checkout similarly to registered customers, with the exception of needing to enter their data manually as there is no pre-filled information available in the checkout forms. They are also limited to 1 shopping list. When proceeding through the checkout, unauthenticated customers can choose whether the wish to register, login or continue as guests. Create one shopping list and add items to it. Save their details for future use on the website. Use the quick order form. Communicate with the manager through the website. Proceed as guests with the option to register within guest checkout. For complete guest checkout experience, it is recommended to enable guest shopping lists, guest quick order form and guest requests for quotes. 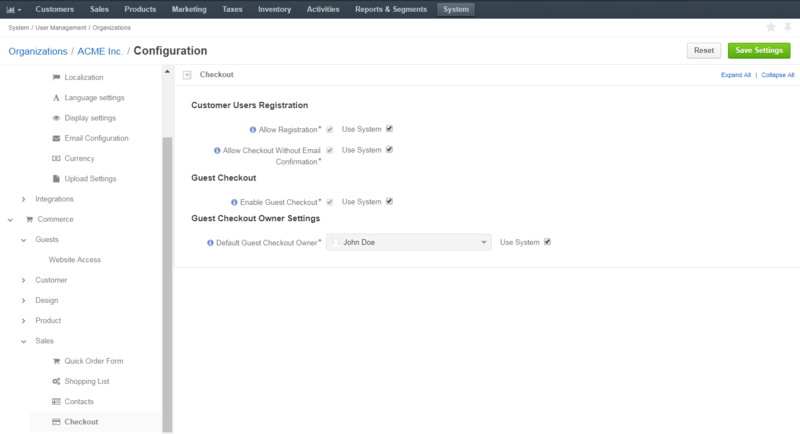 Guest checkout can be configured on three levels – globally, per organization and website. Please note that website settings override organization, organization settings override system settings. Select Commerce > Sales > Checkout in the menu to the left. In the Guest Checkout section, set whether guest checkout should be enabled or disabled. By default, guest checkout is disabled. To enable it, clear Use Default and select the Enable Guest Checkout check box. 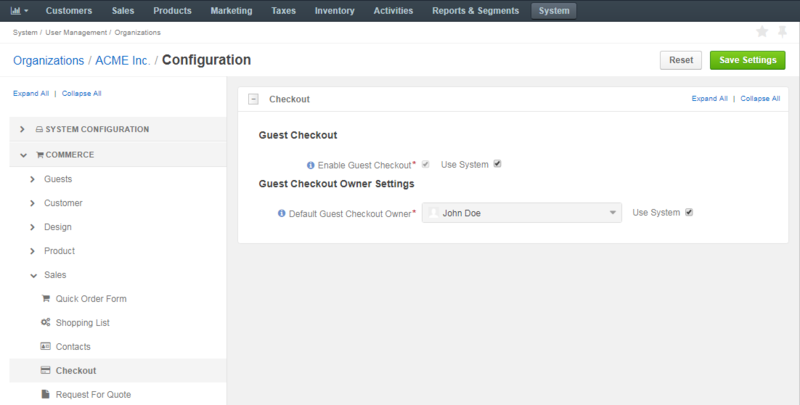 When the guest checkout is enabled, click Save Settings to display the additional Guest Checkout Owner Settings section. In the Guest Checkout Owner Settings section, select the default owner of the guest checkout. Depending on the roles and permissions of the owner, guest data (e.g. shopping lists) may or may not be viewed and managed by the users who are subordinated to the owner. 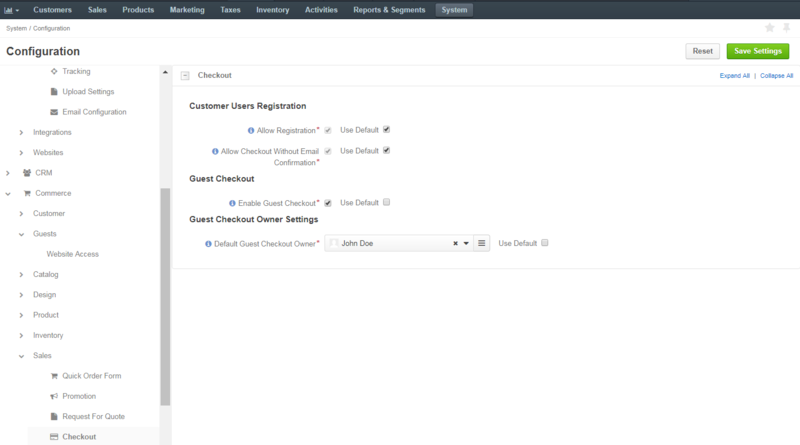 To enable users from the same business unit or organization (that the owner belongs to) to view and manage guest checkout data, adjust permissions for the checkout entity in their roles accordingly. To enable it, clear Use System and select the Enable Guest Checkout check box. 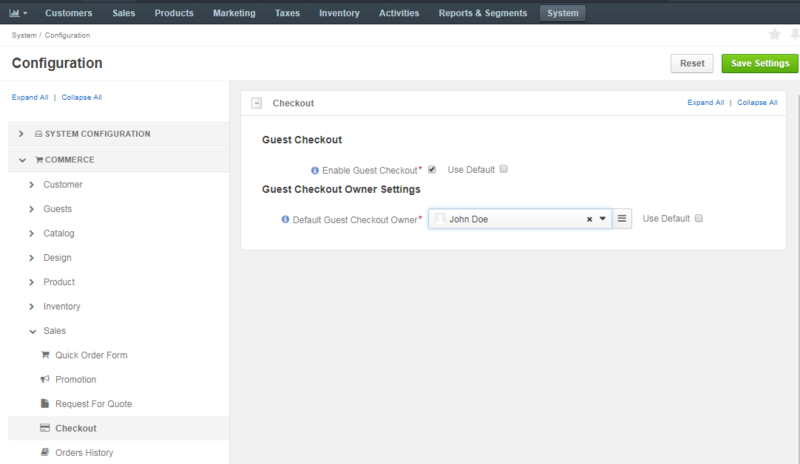 You can control whether guest users are offered to login/register or continue as guests during the checkout. If they select to proceed as guests, they are once again offered to register during order review. In addition, you can enable customers who choose to register at the checkout to proceed through its steps without email confirmation. In the management console, in such case, the placed order will be assigned to this customer as the registered one, instead of being attributed to an unauthenticated user. Guest Checkout with Registration Options can be configured on three levels – globally, per organization or per website. Allow Registration — when the option is enabled, registration is allowed for customers on the checkout page. 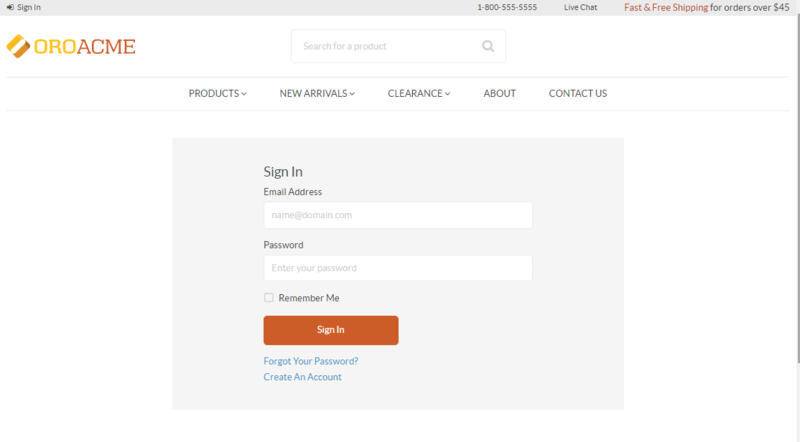 Allow Checkout without Email Confirmation — when the option is enabled, customers proceed to the checkout immediately once registration details are provided. When this option is disabled, the checkout does not start until the user confirms their email address. By default, both options are enabled. However, they are only relevant when guest checkout is enabled. Clear the Allow Registration and Allow Checkout without Email Confirmation check boxes. Clear the Use System check box. You control whether to let unregistered customers purchase goods in the store by enabling or disabling shopping lists. This can be configured on three levels – globally, per organization and website. By default, guest shopping lists are disabled. In addition, only 1 shopping list is available for guest customers. Select Commerce > Sales > Shopping List in the menu to the left. In the Shopping List Limit section, set the number of shopping lists allowed per customer. The default value is zero. This means that no limit of shopping lists is applied. To update any of the options, clear Use Default check box first. 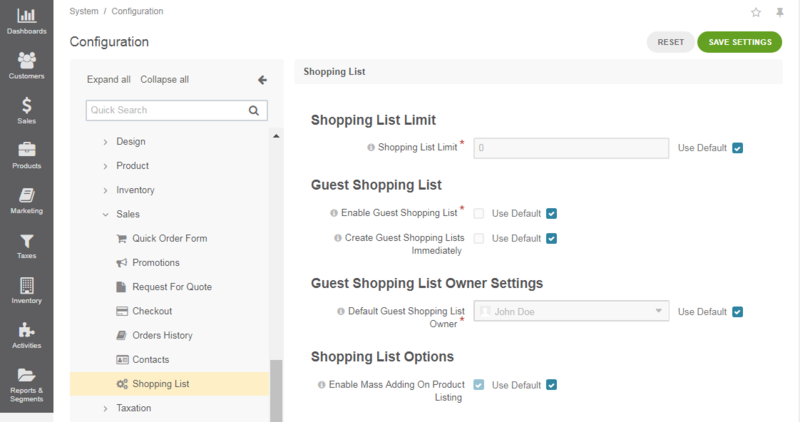 Enable Guest Shopping List — Set whether guests are allowed to create and manage shopping lists. By default, guest shopping lists are disabled. Create Guest Shopping Lists Immediately — Enable this option to automatically create shopping lists for all guest users once they access the storefront. By default, this option is disabled and shopping lists are created only when guest users add at least one item to their shopping list. In the Guest Shopping List Owner Settings section, select the user who will be the default owner of all guest shopping lists. Depending on the roles and permissions of the owner, guest shopping lists may or may not be viewed and managed by the users who are subordinated to the owner. To enable users from the same business unit or organization (that the owner belongs to) to view and manage guest shopping lists, adjust permissions for the shopping list entity in their roles accordingly. In the Guest Shopping List section, set whether guests are allowed to create and manage shopping lists. By default, guest shopping lists are disabled. To enable guest shopping lists, clear Use System and select the Enable Guest Shopping List check box. When the guest shopping lists is enabled, click Save Settings to display the additional Guest Shopping List Owner Settings section. When Use System check box is enabled, system settings are applied. Select Commerce > Sales > Shopping List in the menu on the left. Unregistered customers can use a guest quick order form for fast purchases in the Oro storefront. By default, the guest quick order form is disabled, but you can enable it on three levels – globally, per organization and per website. Select Commerce > Sales > Quick Order Form in the menu to the left. In the Guest Quick Order Form section, set whether guests are allowed to create a quick order form. By default, the guest quick order form is disabled. To enable it, clear Use Default and select the Enable Guest Quick Order Form check box. 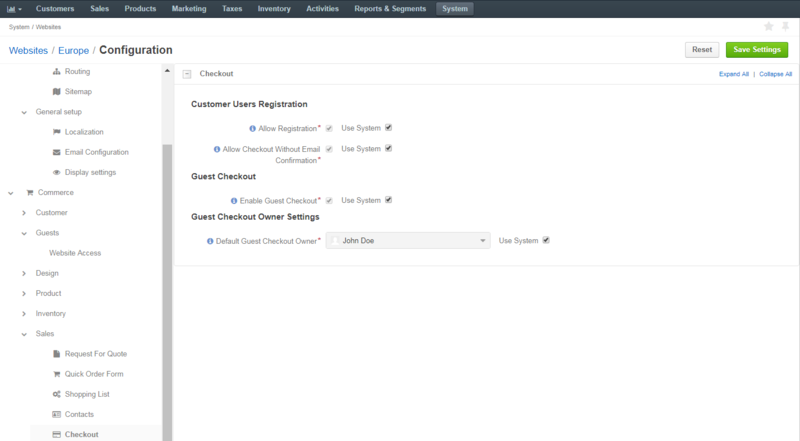 To enable it, clear Use System and select the Enable Guest Quick Order Form check box. In order to let unregistered customers request quotes on the items they are interested in, you can enable Guest RFQ Forms in your Oro application. This will also allow sales reps collect information on potential sales in the management console. This can be configured on three levels – globally, per organization and website. Make sure you enable Guest Shopping Lists in the management console to let guest customers create RFQs from the shopping lists in their storefront. Select Commerce > Sales > Request for Quote in the menu to the left. In the Guest RFQ section, set whether guests are allowed to submit a request for quote. By default, guest request for quote submission is disabled. To enable it, clear Use Default and select the Enable Guest RFQ check box. When the guest RFQ is enabled, click Save Settings to display the additional Guest RFQ Owner Settings section. In the Guest RFQ Owner Settings section, select the user who will be the default owner of all guest RFQs. Depending on the roles and permissions of the owner, guest RFQs may or may not be viewed and managed by the users who are subordinated to the owner. 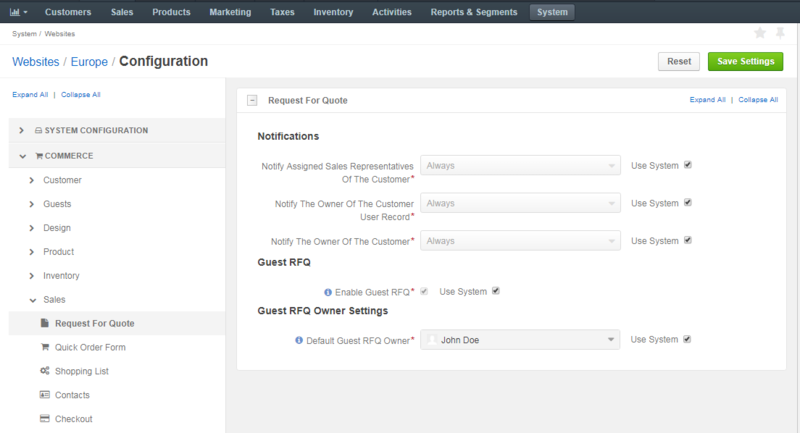 To enable users from the same business unit or organization (that the owner belongs to) to view and manage guest RFQs, adjust permissions for the Request for Quote entity in their roles accordingly. To enable it, clear Use System and select the Enable Guest RFQ check box. 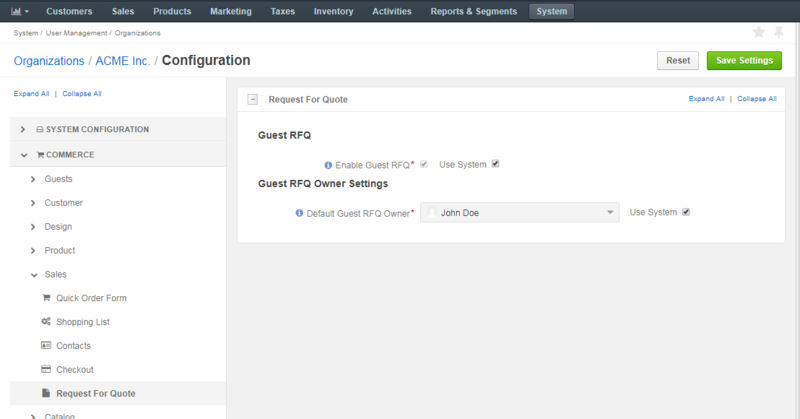 To issue quotes to guest customers via direct links, enable guest quotes in the system configuration. Select Commerce > Sales > Quotes in the menu to the left. Select the Enable Guest Quote check box. This enables the generation of unique links for sending quotes to guest users.